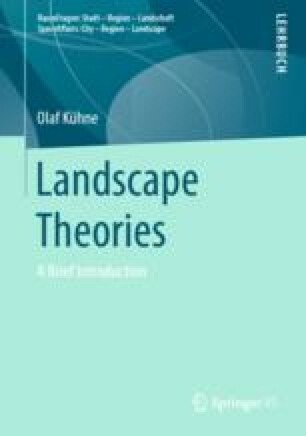 The multiperspectivity of landscape-theoretical research can be made clear by means of the photo series shown in the Fig. 1.1. The depicted physical space can be interpreted essentialistically as a landscape that has undergone intensive anthropogenic transformation with the development of specific survival strategies since Roman times, at the most recent. Positivistically, it can be understood as an object in which the proportions of land uses, geological units or preference rates can be quantified.